Are you looking for help to position your employees with your mission and vision? Sieve Softech provide professional corporate training for companies. Training in digital marketing, web development, big data etc.. We provide training to your employees to engage with your mission, vision, values, and strategic plans. Sieve Softech is a pioneer Corporate Training consultants training providers. we provide customized programs for startups, corporate Companies, and businesses. We are Best training Agency for corporate companies. 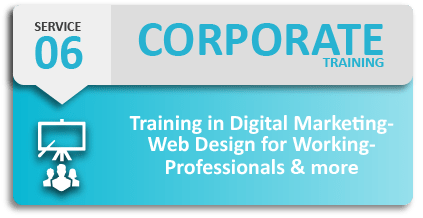 We offer corporate training for Digital Marketing, Web Designing and App Development etc. We have experienced trainers to provide training to your employees. Let us increase your company’s growth. Our trainer's design and develop courses, training skills, and offer a wide range of employee training programs. The training modules differ from industry to industry. And it depends on the experience and the learning ability of the employees. We have high industry training modules for the different sectors of the industry. We are selective while picking faculty members for our Corporate Training modules. The priority is always on to find the optimal combination of expertise and experience.